Every so often, the vision and skills of many people combine to create something that is the very definition of a “masterpiece.” Todd Wiley and his team at TruKitchens near Grand Rapids, Mich., have done a lot of great-looking kitchen and bath projects over the years. Out of those, “we work on a handful of projects that are very special to me and my team, and this is one that we’ll never forget. This is one where we really got to shine as designers,” said Todd. The project was massive in scope and exquisite in design. It involved a two-year process that began for Wiley and his team when they started working with the architect and the design team of their client’s new home to ensure the right amount of space to accomplish what the client wanted in the way of multiple kitchens, bathrooms and more. The multi-room design process is highlighted by distinctive touches in the main kitchen that include a massive, custom-designed island with furniture quality details and a colossal hood that also matched the custom design and pushed hood ornamentation “past boundaries that I’ve never crossed before,” said Todd. 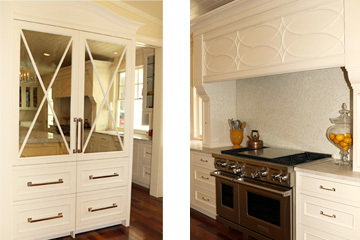 The show stopper’s perimeter cabinets featured a Newport Indor 5 door style in maple with a White Dove finish. 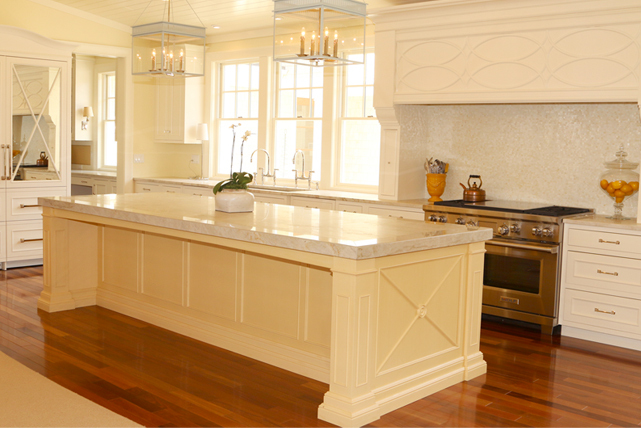 The island was an exact custom color match of a Pratt and Lambert finish with a brushed finish glazing technique that even included the outlet covers. Another dynamic element for the kitchen was the refrigerator cabinet with antique mirrored mullion doors and a bonnet top that provided a stunning armoire look. A butler’s pantry in an adjacent room, done in the same maple door style and White Dove finish, augmented the main kitchen with an ensemble of mullion cabinetry, mirrored backsplashes and a desk area with a home management center and pullouts for a printer and file drawer. 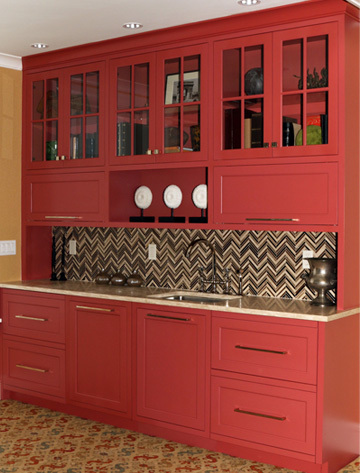 Todd and his crew also put together a lower level kitchenette in Benchmark maple with an Olde Towne Indor 5 door style in a custom red (P8392). Such stunning, custom detail continued in other creations throughout the home that included a glamorous master bath with elaborate mirroring and glass crystal knobs as part of a cabinet scheme using the Newport door style in maple with a White Dove finish, all custom built by Grabill from design drawings produced by Todd and his team. 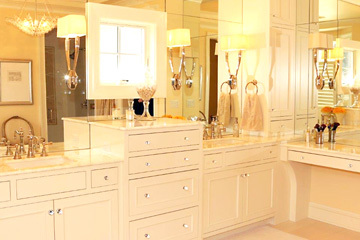 Grabill custom touches even extended to a small powder room, where Grabill took a cabinet that the owners liked but was the wrong size for the room and duplicated it in the appropriate size. And still there was more! Another kitchen was also added to the adjacent carriage house apartment with maple, frameless Benchmark cabinetry in Grabill standard Super White finish with a maple Old Towne FO door style. The carriage house bathroom replicated the same design elements. 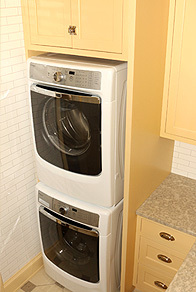 A final exclamation point, a spacious laundry room was also designed with custom cabinets with Olde Towne Indor 5 doors in Benchmark Maple and a light custom finish (P8317) with a G020 Sheen 20 topcoat.